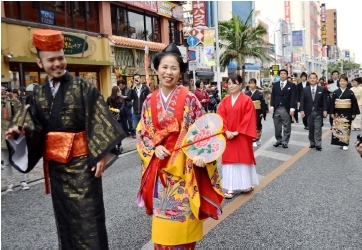 On February 8 at Kokusai Street in Naha City, Yoshitomo Tsuha and Wakana Tsuha paraded down Kokusai Street for the “Ryu-kon in Kokusai Street & Tenbusu Naha,” which was a re-enactment of a traditional Ryukyu wedding ceremony. On February 8 at Kokusai Street and the Naha Bunka Tenbusu Hall in Naha City, a public Ryukyuan wedding was held. The ceremony was a re-enactment of a traditional ceremony from the Ryukyu Kingdom era. ANA Crowne Plaza Hotel Okinawa Harborview sponsored the event to commemorate its 40th anniversary. Twenty-four-year-old groom Yoshimoto Tsuha and 25-year-old bride, Wakana were selected among 40 couples that applied. Wearing traditional Ryukyuan clothes and performing a traditional newlywed ceremony, they received many blessings at the beginning of this new phase of life. For the “Niibichi Parade,” the bride, groom, and their families were led by a flag holder paraded from the Mutsumi Bridge in Naha City. The newlywed couple appeared to be shy after being cheered by friends. After the parade, a wedding ceremony was held in front of the Tenbusu Naha plaza. The couple performed the newlywed ceremony of Nudinuchaaji, for which the couple wore a piece of kimono. At the end, audience and tourists also joined in to dance kachaashii.